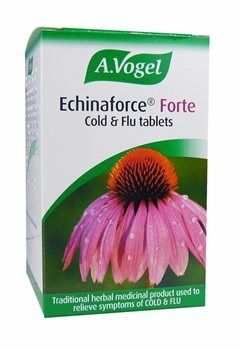 Echinaforce Forte Cold & Flu Tablets: a traditional herbal medicinal product used to relieve the symptoms of the common cold and influenza type infections, exclusively based upon long-standing use as a traditional remedy. I tablet contains 1,140mg of extract (as dry extract) from fresh Echinacea purpurea (L.) Moench herb (1:12) and 60 mg of extract (as dry extract) from fresh Echinacea purpurea (L.) Moench root (1:11) Extraction solvent: ethanol 65% v/v. The other ingredients used for the tablet are lactose, pregelatinised starch, magnesium stearate and soya polysaccharide. Do not use if you are allergic to peanut or soya. Take 1 tablet two to three times daily. This product is not suitable for children under 12. Do not use if you are allergic to Echinacea, other members of the daisy (Asteraceae/Compasitae) family or any other ingredients.